At Boyles General Dentistry & Implant Center, our commitment to modern oral healthcare will be apparent from the very first appointment. By utilizing state-of-the-art tools whenever possible, we can improve comfort, increase treatment speed, elevate diagnostic accuracy, and offer many more valuable benefits to our valued patients. Your smile deserves the best! Please contact our practice in Midland, TX today if you have any questions, or if you’re ready to schedule a first appointment. Dr. Stephen Boyles, Dr. Franklin Boyles, and Dr. T Ken Etheredge look forward to meeting you. Being able to see what your dentist is seeing as they peer inside your mouth is a one-of-a-kind educational opportunity, and intraoral cameras make it a reality! We’ll insert the camera-tipped wand past your lips and start capturing high-resolution images right away. These images are sent to our computer system and then to a convenient TV monitor in the room for easy viewing. As a result, our dentists will able to refer to them when discussing problematic areas and potential treatment recommendations. 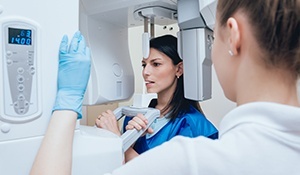 Our Midland practice has left traditional film X-rays safely in the past, investing instead in digital radiography that transforms this essential diagnostic process for the better. Now, highly detailed X-rays are captured and available to view in seconds – no darkrooms, no hazardous chemical development. Our team members can even color-code and rotate the X-rays to enhance our patients’ understanding of what they’re seeing. Radiation exposure is dramatically reduced by up to 80%, which makes this technology much safer as well. 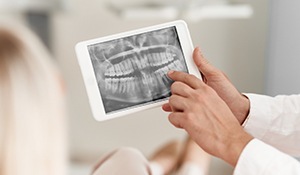 While digital X-rays are an excellent tool for understanding a patient’s full oral health, their scope can be limited in some cases. When planning complex treatment like dental implants, root canals, or even TMJ therapy, our dentists want to ensure the highest level of success and safety possible at all times – that’s why we utilize a state-of-the-art CT/Cone Beam scanner. This technology will capture a three-dimensional model of the patient’s smile, jaw, skull, and related facial structures, effectively capturing every detail we could possibly need to know when planning out procedures. Most older patients surely remember the days of needing a new dental restoration and having their mouth stuffed with goopy impression materials. In addition to the discomfort and likelihood of gagging, this technique also often resulted in incorrect models and time-consuming retakes. At Boyles General Dentistry & Implant Center, we’re proud to now offer a much more sophisticated and effective technique: digital impressions. 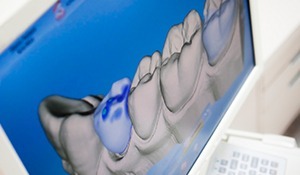 Digital impressions require NO physical contact on the patient’s part. Our team will simply complete a few scans of their mouth with the technology, which creates a digital model that we can use to accurately design restorative work. Your new smile improvements will exceed expectations!